⦏Breaking News Eclipse Sirius⦎ SiriusCon 2017! SiriusCon 2017 has never been so close! The third edition of this conference will take place this Thursday, the 9th of November in the beautiful Paris! A whole day of exclusive content: presentations with a specific focus on Eclipse Sirius itself, others about companion technologies and feedback from users who used these technologies to build their custom tools! This year these tools are covering activities ranging from the Risk Analysis in Industry Supply Chains to the design and management of REST API for an enterprise information system. One can learn a lot from the experiences of the others and I’m often amazed at the tools which are getting built. We’ll start the day with a keynote by Mike Milinkovich, the executive director of the Eclipse Foundation. It’s an honor to host such an important actor in the Open-Source movement, he has a unique perspective regarding what happened in the Software Industry the last decade and how Open-Source enabled worldwide collaborations. This keynote is especially relevant for such a conference as Sirius is part of a rich ecosystem of technologies, products and companies and is an integral part of the Eclipse world. 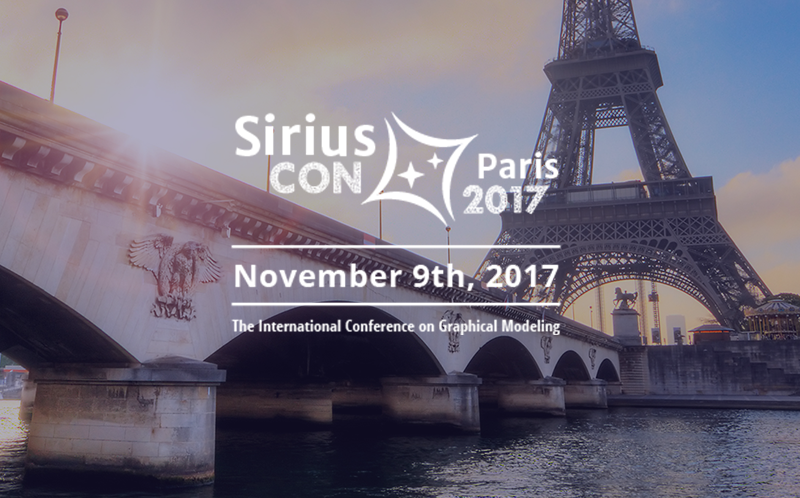 The event also features talks with a particular focus: document generation from models, simulation and animation, diagram layouting, using Xtext and Sirius or learning how to smooth the user experience of your graphical modeler. Last but not least, tutorials during the afternoon to either discover or sharpen your skills! Find out the complete program. Content is one thing, but we are also organizing the event so that you will enjoy a nice time in a friendly atmosphere. This is the occasion to get in touch with the team, chat with other users, directly provide your feedback or get some direct help with the clinic. We’ll also prepare a showcase area to demonstrate tools and technologies, both for beginners and advanced users. Do yourself a favor and do not hesitate to reach out to people here. You get exclusive content at SiriusCon, insights you can’t find anywhere else, sharp details about the technology, its use and deployment and its direction, and you also get to enjoy lively chats in a delightful place, right next to the Montparnasse train station (at the Novotel Paris Vaugirard). The event is free but the room is limited, make sure to register soon! ⦏Breaking News Eclipse Sirius⦎ SiriusCon 2017! was published on November 06, 2017. Cédric Brun is the CEO at Obeo, a French tool vendor helping organizations face complex systems to reach their goal through design tool. I started as a software engineer with a hint of academia through a master degree. I got involved in open-source projects quite early through contributions to KDE or the Linux Kernel, I then joined the Eclipse community and I am leading couples of projects there (EcoreTools, Amalgamation) and I am a member of the Architecture Council. The itch I keep scratching is 'How can we make better and open tools, faster?' and that led me to domain specific modeling practices and technologies. I like to share my findings through conferences and happened to co-author a number of articles and research papers. Wednesday, 28 November 2018 ⦏Eclipse Sirius⦎ SiriusCon 2018 is SiriusCon Live! Monday, 06 November 2017 ⦏Breaking News Eclipse Sirius⦎ SiriusCon 2017! What makes EclipseCon Europe a good conference ?